Premièring on the 10th of January 1927 Fritz Lang’s Metropolis did not receive unanimous positive reviews and was not the box office smash that UFA had perhaps been hoping for. For the US release the film was substantially altered and a significant amount of footage completely excised. This was just the beginning though and the film has since been released in a variety of cuts with a differing translations and scores. In 2008 a major discovery occurred and the most ‘complete’ version of Metropolis was found in Argentina. You can find more details on the differences in the newly found version and my full review of the ‘complete’ cut here. The new restoration uses the best available material throughout and the only parts of the film that are not stunning in their quality, for a film over eighty years old, are the recently discovered scenes. Sourced from the Argentinian materials these are of extremely lower quality and restoration expert Martin Koerber even goes so far as to describe them (in the documentary included in this release) as “…the worst material I have ever seen in my life”. A digital restoration was undertaken though and although these sequences stand out as being of a much lesser quality what they add to the film in other areas make them essential. The transfer to Blu-ray is of a very high standard with a clear 1080p transfer and a beautiful newly recorded score based on on the original composition for the film by Gottfried Huppertz. Apart from the obvious and unavoidable print damage issues on the main feature the only issues I found were a few picture errors on the documentary Die Reise nach Metropolis but these were extremely minor and will not effect one’s enjoyment. The extras are particularly good, the disc including the aforementioned documentary and also a commentary from David Kalat and Jonathan Rosenbaum (not included on the US edition). The commentary is relatively lively and informative although there are perhaps too many occurrences where sections are read from articles on Metropolis. Perhaps most interesting is the pair’s discussion of the concept of the definitive version of Metropolis and how this seems to be at the expense of any other versions. The debate raised is an interesting one and is particularly relevant as MoC have only included the ‘complete’ cut on this disc. The Masters of Cinema Blu-ray is still an essential purchase though for any fan of the film and is an absolute joy to watch. 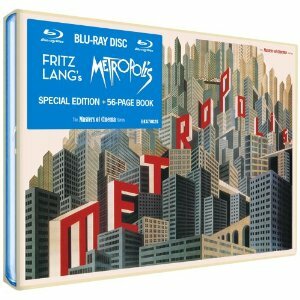 The Masters of Cinema edition of Metropolis is available to buy now on Blu-ray, DVD and limited edition dual format steelbook. • 56-page booklet featuring archival interviews with Fritz Lang, a 1927 review by Luis Buñuel, articles by Jonathan Rosenbaum and Karen Naundorf, and restoration notes by Martin Koerber. Is there a new version of Spider-Man 3 on the way?